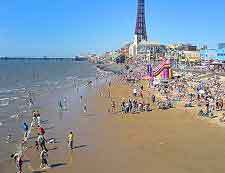 Blackpool continues to surprise people with its unstoppable popularity as a major seaside resort and competes on an equal key with many of Europe's top budget destinations. 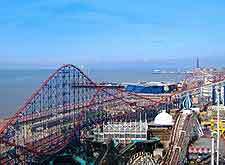 Full of traditional seaside fun for all the family, Blackpool has it all, with an endless stretch of sand, a famous tower, and one of the country's best roller coaster theme parks. Blackpool is by no means a sophisticated resort and yet continues to lure many thousands of tourists all through the year, particularly during the summer months, and the charm and appeal of this town should not be underestimated. Tourism has long been Blackpool's main business and this is exploited at every means possible. 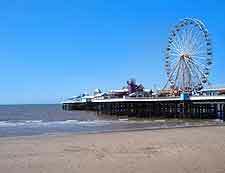 With an infectious Golden Mile area, located next to the beach and full of bright lights, amusement arcades and gift shops, Blackpool is also known for its seaside theatres, live entertainment, ballroom dancing and of course, donkey rides. The Blackpool Tourist Information Centre (TIC), situated along Clifton Street, is a good place to visit as soon as you arrive in town, being full of tourist advice and helpful tourism tips and advice. Blackpool's most visited tourist attractions include the Pleasure Beach - the UK's top outdoor attraction, featuring more than 70 fast rides and roller coasters; the Sea Life Centre - full of marine life, complete with underwater tunnel and many huge sharks; the Blackpool Zoo and Dinosaur Safari - full of animals from all over the world, including a gorilla mountain, elephants, tigers, a tropical rainforest area and plenty of educational information; and the Sandcastle Waterworld - an exceptional water park with many fast slides, a wave pool and 'water roller coaster'. Further tourist attractions and prominent landmarks around the town include the Blackpool Tower - one of the most dramatic structures on the town's skyline, perhaps most famous for its huge ballroom and afternoon teas; the Three Piers - historic Victorian seafront structures containing theatres, a Victorian carousel, a Sky Coaster ride and enormous big wheel; Blackpool's Stanley Park - an important spreading area of green with gardens, seating areas, playgrounds, a model village and leisure centre; and also the Winter Gardens and Opera House - large theatre complete dating back to 1878 and regularly hosting many important dancing events and concerts. 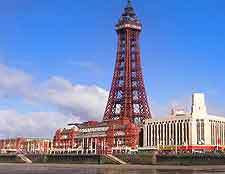 More information about Blackpool Tourist Attractions and Blackpool Landmarks. Some of Blackpool's best museums and art galleries are targeted at visiting tourists and include the Louis Tussaud's Waxworks - features over 150 waxwork models of celebrities, rock stars, royalty and politicians; and Blackpool's Grundy Art Gallery - a highly regarded gallery containing a surprising collection of paintings, together with many year-round temporary exhibitions. 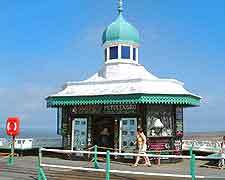 More information about Blackpool Museums and Art Galleries. Tourist attractions sited close to Blackpool include many towns and villages, such as those around the scenic Ribble Valley. Also nearby are the villages of Churchtown and Marsh Mill, and the towns of Fleetwood, Lancaster and Morecambe. More information about Blackpool Attractions Nearby.